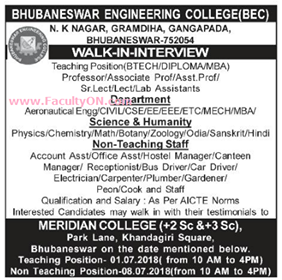 Bhubaneswar Engineering College, Bhubaneswar has advertised in SAMAJA newspaper for the recruitment of Professor/Associate Professor/Assistant Professor job vacancies. Interested and eligible job aspirants are requested to appear walk in on 1st and 8th July 2018. Check out further more details below. About College: Bhubaneswar Engineering College was established in 2008 and is being managed by Nabakalebar Charitable Educational Trust with the mission to "create engineering minds capable of mastering the global challenges of tomorrow's technology". The Institute is approved by the All India Council of Technical Education (AICTE) under MHRD,Govt of India and is affiliated to Biju Patnaik University of Technology (BPUT). The lush green campus comprises of 27.5 acres of land and located at the picturesque about 4 kms from International Airport Bhubaneswar. The Institute has been growing up by leaps and bounds under the able leadership of the founder Er.N. K. Mallick, Patron-in -Chief, Er.Prabhat Ranjan Mallick, Chairman KGI, Er. Alok Ranjan Mallick, Vice Chairman KGI & Chairman BEC.